The goat is one of the 12 Chinese zodiac animals. It represents introversion, creativity, shyness and being a perfectionist. Goats were one of the first animals to be domesticated and have been used for their milk, meat, hair, and skins all over the world. There are over 100 distinct breeds of goat and there are more than 924 million live goats in the world. 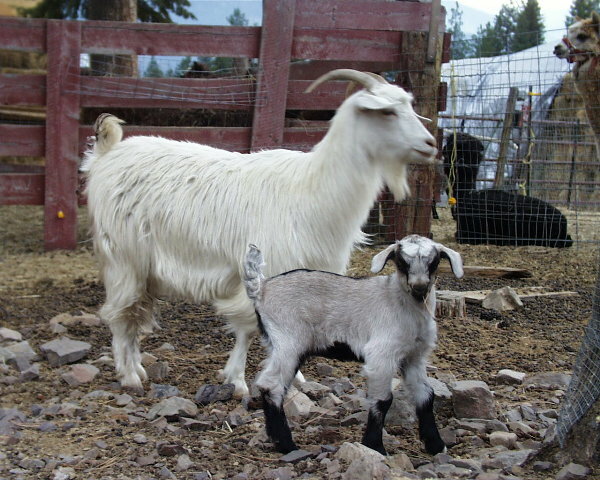 Alpine goats, sometimes referred to as the Alpine Dairy, are hardy medium-sized milking goats. 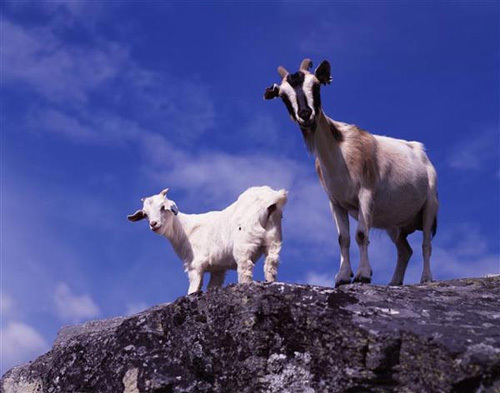 Alpine goats are originally from the French Alps. They have no set markings and they have erect ears, horns, and have a dish-face. They have a straight face with a Roman nose. 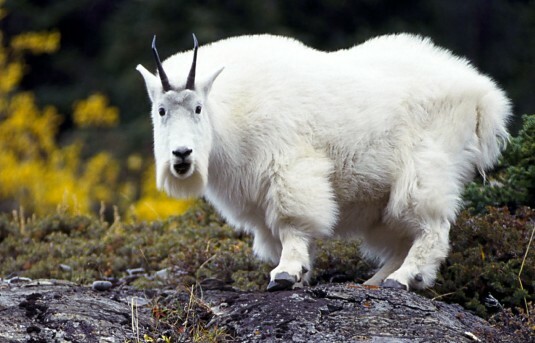 Mature female Alpine goats weigh around 125 lbs, and are about 30 inches tall at the shoulder. ·Cou Blanc - (coo blanc) literally "white neck" - white front quarters and black hindquarters with black or gray markings on the head. The Altai Mountain goats, or Gornoaltaiiskaya, are wool-producing goats from the Altai mountains in Gorno-Altai Autonomous Region of the former Soviet Union. Their diet consists mainly of grasses and other plant life and they graze almost constantly during the day. Unlike some other breeds of wool producing goats, the Altai mountain goats are very consistent on their wool production amounts from one goat to the next. There is usually only a ten percent difference in yield at a maximum. They are quite uniform in both color and size and mature slowly, not reaching full adult status for five years or more. 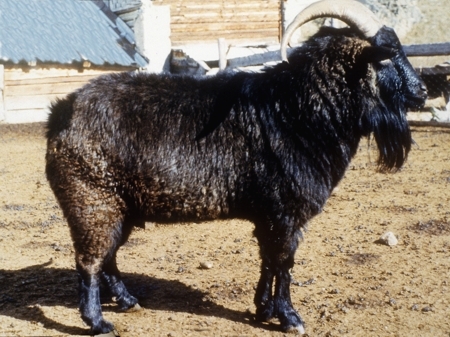 Inrnthe 1970s Wild goats from Australia were crossed with Spanish meat goats livingrnin the American southwest and after years of selective breeding, AmericanrnCashmere Goats were developed. Americanrncashmere goats are still considered rare, but the North America herd is increasingrnin size. AmericanrnCashmere goats start growing a new coat of cashmere fiber each summer. Therncashmere fiber starts to loosen and shed in early spring. The natural color ofrncashmere fiber is usually light to chocolate brown, cream, white, or gray. 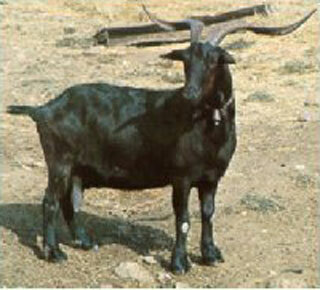 The Anatolian Black goat is raised in Turkey for its meat, milk, and fiber. They are usually black but sometimes they are brown, gray, or pied. 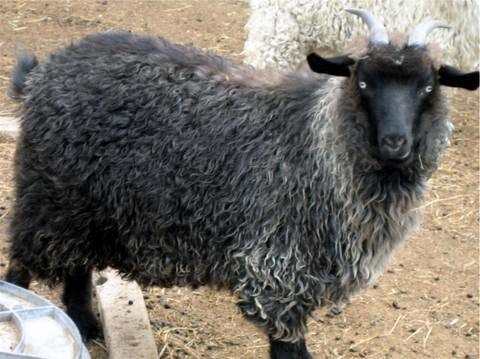 Anatolian Black goats are a Syrian type goat with large, drooping ears, and coarse flat long hair. Anglo-Nubian goats were developed in England by crossing British goats with African and Indian bucks. Anglo Nubians are all-purpose goats (meat, milk and hide production). They are not a heavy milk producer but they have a high average butter fat content (between four and five percent). The Anglo Nubian breeding season is much longer than that of the Swiss breeds so it is possible to produce milk year round. They are best suited for milk production in hot conditions and are used in grading-up programs in many tropical countries to increase milk and meat production of local breeds. TheAngora goat is a breed of domestic goat named for Ankara,Turkey, historically known asAngora. 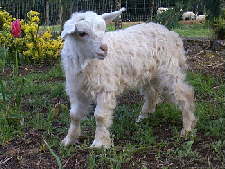 Angora goats produce mohair fiber. 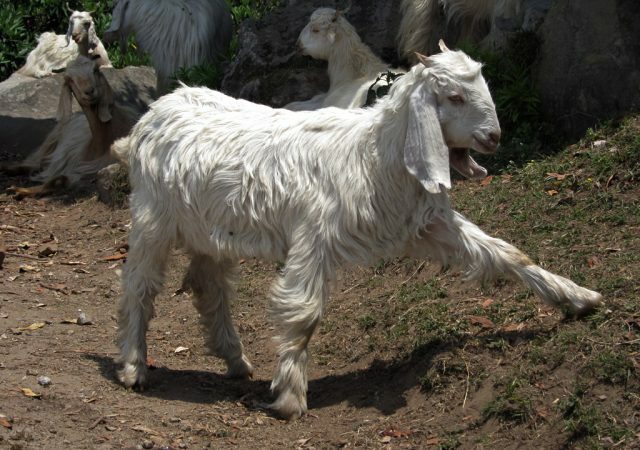 This goat breed has pure white coat with hair at mid length. It has a well-built body with powerful and well positioned legs. It is hornless and has height that ranges from 70 to 80 cm and its weight from 45 kg to 65 kg. 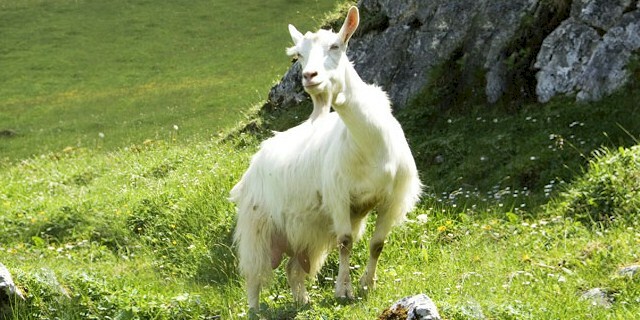 Appenzell Goat milk production is comparable to other breeds of goats. During lactation between 700 and 800 kg, fat 2.9%, protein 2,7%, lactation duration 270 days. The number of registered animals is around 800; the stock is slowly increasing again. This breed was very heavily affected by the CAE-Virus, so that extensive restoration had to be done. Today the breed is essentially CAE-free. 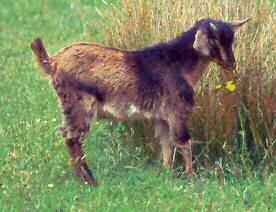 The Arapawa Goat is one of the rarest goat breeds in the world and is critically close to extinction. The Arapawa Goat is a breed of feral goat descended from Old English milch goats released on Arapawa Island off the coast of New Zealand. It is directly descended from a breed of English landrace goat which no longer exists in its native England. Extremely rare today, a few have been exported to North America and other regions. These goats were originally put on Arapawa by the inhabitants of the bay named Te AwaIti Whaling Station in the early 1800s. Argentata dell Etna Goats are from Etna and Peloritani (Sicily), Italy. They are also raised in the provinces of Enna and Palermo. They are named for the volcano, Mt. Etna. It’s unknown how they were developed; however, they have similarities to Garganica, Ciociara Grigia, and Cilentana Grigia Sheep. Their coat is grey shading from light to dark with silver glints. They have rough, average long-haired and grey skin. Argentata dell’Etna females have upright horns and the males’ horns are very large and wide apart. They are suitable for both milk and meat (kids around 12-14 kg alive). Milk is used for typical local cheese varieties. At the end of 2013 the total population is not more than 7000. Goats are reported to have been liberated in at least ten places on the Auckland Island group, New Zealand, in the second half of the nineteenth century as food for castaways, with at least one liberation in 1865 on the main Auckland Island. In 1934 the islands were defined as Nature Reserves and today they are administered by the Department of Conservation. By the 1970s, only one population of about a hundred goats remained, these living on the north-west side of Port Ross, one of the driest and warmest parts of the main island. Long before the British settled Australia, goats were released on the islands off the coast of Australia by Dutch and Portuguese navigators. These goats come from a great variety of backgrounds and they acclimatized readily to the Australian environment. In 1832 William Riley, imported goats to his property at Raby, New South Wales. Also he delivered a paper to the Agricultural and Horticultural Society of New South Wales in an effort to encourage the development of a cashmere/angora fleece industry in Australia. In addition more goat where imported from India. 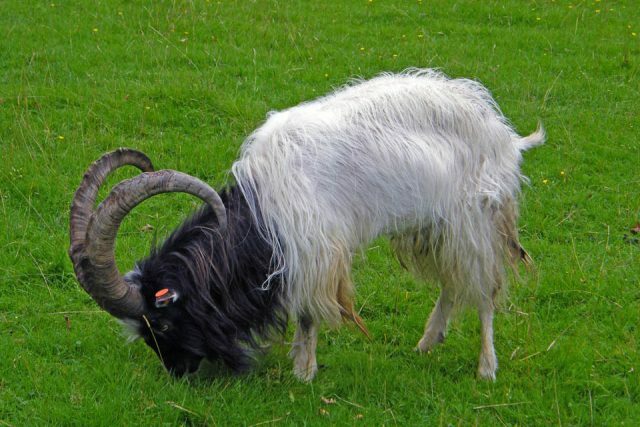 For several hundred years bagot goats have lived semi-wild atBlithfield Hall in Staffordshire, England. Bagot goats were introduced to England at Blithfield Hall in the 1380s. They were probably brought back to England by returning Crusaders, and probably trace their ancestry to goats of the Rhone valley. The goats were said to have been given to John Bagot of Blithfield by King Richard II of England to commemorate the good hunting the King had enjoyed at Blithfield. Bagot goats are small and have a black head and neck but a white body. 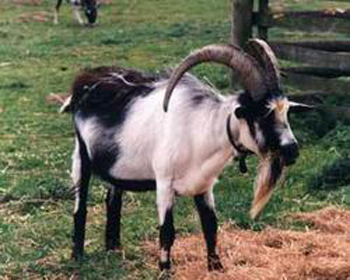 Barbari goats are meat goats from Pakastan. They are small goats and theyrnare creamy to golden white - sometimes with spots. Their meat conformation isrnconsidered good and they are known for Triple kidding and early maturity. Beetal goats both meat and milk goats. They also known as Amritsari goats and are from Pakistan and India. They usually red, black or pied with pendulous ears. The males have long twisting horns. They have a large body and usually they give birth to two or three kids at a time. Beetal goat skin is considered to be of high quality because they are large and yield fine leather such as velour, suede, and chamois for manufacturing clothes, shoes and gloves. 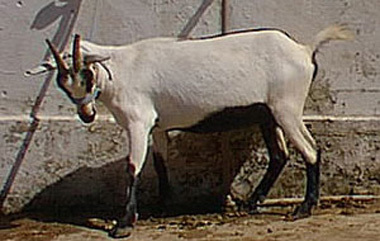 Beetal goats have been widely used for improvement of local goats throughout the subcontinent. Belgian Fawn goats are from Belgium and are descended from Chamois Colored goats of Switzerland. As such, they are related to and similar to the Oberhasli goats bred in the United States. They are horned, are black or brown, and have black skin. Adult males weigh on average 65 kg and females 60 kg with an average wither height of 81 cm and 71 cm respectively. 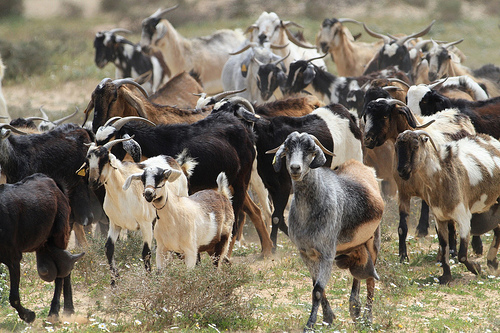 Benadir goats are found in the Webi Shibeli region of southern Somalia. They are used for both meat and milk production. They are often red or black spotted and have lop ears. Bhuj goats are from northeastern Brazil and are used for both milk and meat production. They are usually black with white or spotted lop ears and a Roman nose. They originated from the Kutchi goats of India. 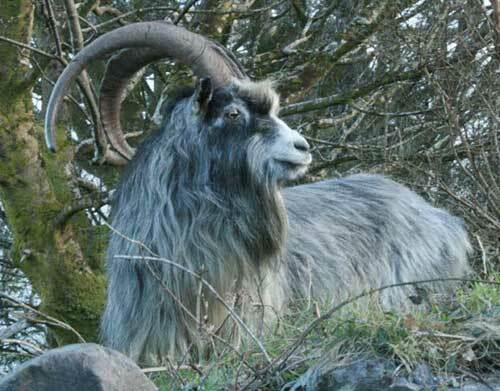 Bilberry goats are a unique breed of feral goats that are believed to have lived in one herd on Bilberry Rock in Waterford City in the south of Ireland for hundreds of years. 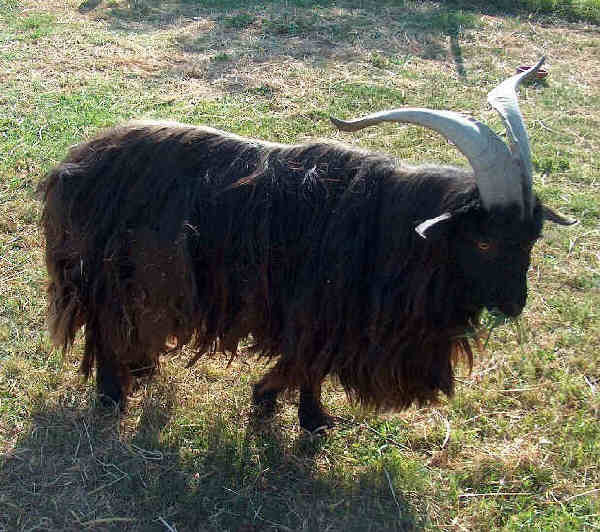 They are large, with shaggy coats and very large horns. Bilberry goats are not like any other breed of goat found in Ireland or Great Britain, the Bilberry herd is thought to be related to Pashmina, Maltese or Cashmere goats. Locals believe they came over with the Huguenots from France over 300 years ago and have lived on Bilberry Rock ever since. 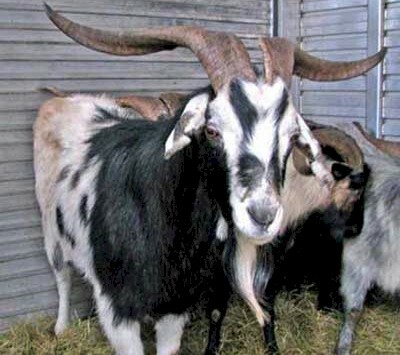 Bionda dell''Adamello goats are from the northern Italian Region of Lombardia. They got their name from the color of their hair - Bionda in Italian means Fair - and from the mountain "Adamello" which is part of the Italian Alps. 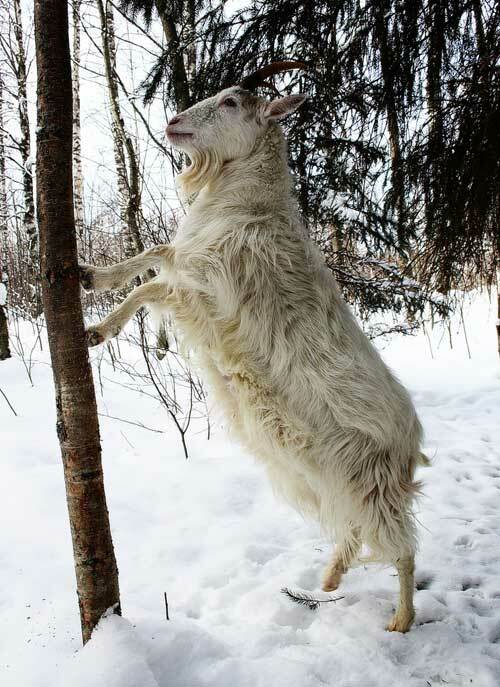 Bionda dell''Adamello goats appear to be of ancient origin. A painting from about 1760 by the Milanese painter Francesco Londonio shows a Bionda dell''Adamello goat. 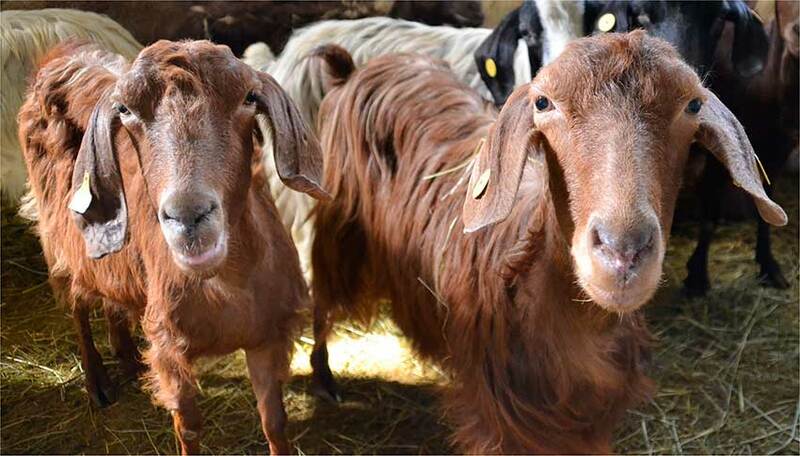 Bionda dell''Adamello goats are used for milking, for cheese production; usually Fatuli and the Mascarpi cheese. They are noted for producing around 350 kilos of milk with 3.2% of fats and 2.96% of proteins. In some management, milk production can reach 500 kilos. 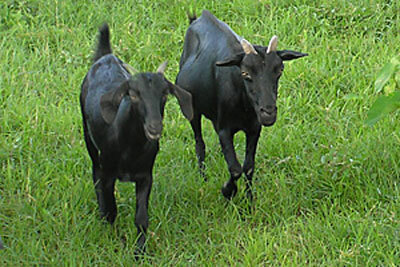 Black Bengal goats come from northeastern India and throughout Bangladesh. They are a small meat and dairy goats. The Black Bengal is a prolific breed and while usually black it is also found in brown, white, or gray. They have a short coat and ears and are bearded. They have small horns and short legs. 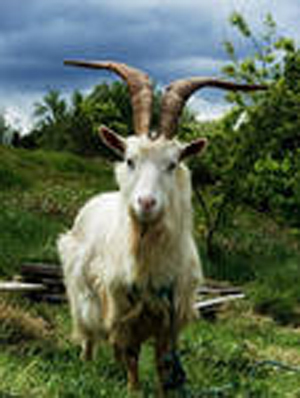 An adult male goat weights about 25 to 30 kg and female 20 to 25 kg. They are poor at milk production, but they produce high-quality meat and skin. 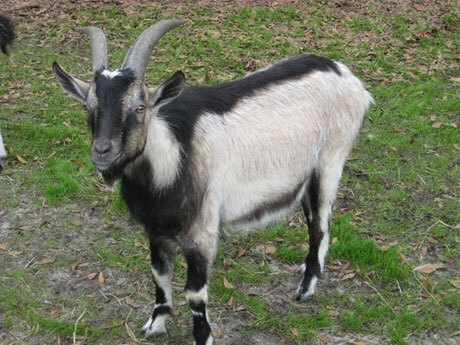 Boer Goat were developed in South Africa as a meat goat. Their name is derived from the Afrikaans word "boer", meaning farmer. They were probably bred from the indigenous goats of the Namaqua Bushmen and the Fookutribes, and perhaps some Indian and European bloodlines. 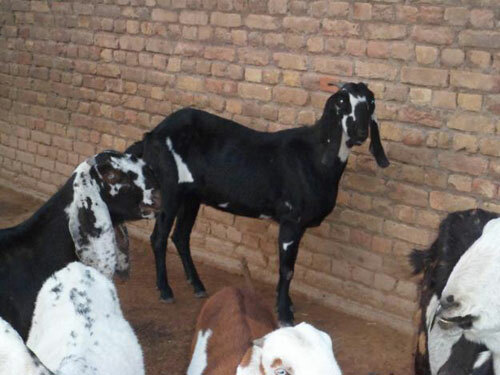 They were selected formeat production; due to selective breeding, the Boer goat evolved into has a fast-growing goat with excellent carcass qualities, making it one of the most popular breeds of meat goat in the world. Booted Goats are Swiss goat variety of Mountain Goat. Booted Goats are a robust, vivacious, horned goat. They are bright gray-brown to dark red-brown with black or brown markings (black or brown boots). Bormina goats are a composite of local Italian goats and Toggenburg Goats from Switzerland. They are from Bormio (Valtellina, Bormio Province, Northern Italy). They are raised for Milk production. They are medium-large, light brown - red brown. British Alpine goats were developed in Great Britian in the early 1900s. The first British Alpines arrived in Australia in 1958 and have since been up graded using Saanen and Toggenburg does. British Alpine goats are tall, rangy and graceful. British Alpines are black with white markings. Their coat is generally short, fine and glossy. However bucks often have longer hair. They are best suited to temperate climates and perform poorly in regions with high humidity. The does are good milk producers, with an average fat yield of four percent. They also exhibit a tendency towards good winter milking and have an extended lactation period. 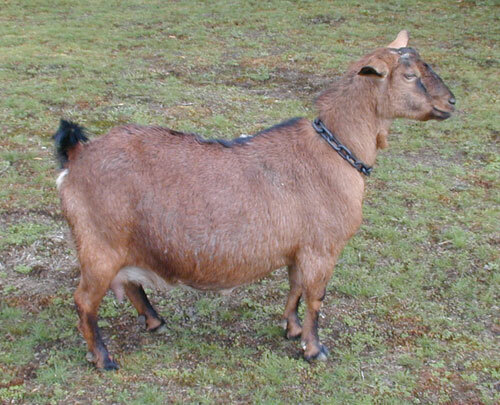 Brown Shorthair Goats have been improved since the end of 19th century. They originated with a native breed of un-uniform color, mostly light-brown to white goats, improved by crossing with German brown (Erzgebirgziege) bucks. They were recognized as an autonomous breed in 1954-55. They are found in the northern and western mountain regions of the Czech Republic. They have glossy short hair, a cinnamon to ferruginous or dark brown coat and face. They have eelstripes that run from cantle to tailtip. Their belly, shank, and hooves are black. They have upright ears and they are mostly (75-80%) hornless. Canary Island Goats are found in Spain. They are kept primarily for milk production and are found in many colors. The horns are sabre or twisted. They are usually free from modern diseases that inflict dairy goats. They are able to live well even in the mountains and island cliffs. They have tough legs with tiny udders. They will eat just about anything including bags or clothing. Caninde goats are from northeastern Brazil. They are predominantly black with light stripes on their face, chest, and lower legs. Capestrina Goats most likely originated on the Lepini, Ausoni and Aurunci mountain (Italian provinces of Rome, Frosinone, Latina, - Latium). 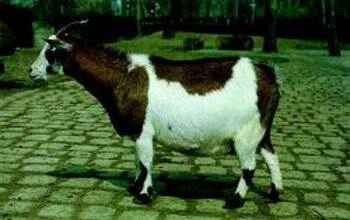 Quite rarely Capestrine goat are bred, more often they are bred with Ciociare, Monticelliane goats and hybrids. Males are 93-94 cm high at the withers and weight 85kg; females are 74-79 cm high and weight 46-53 kg. Their coat is black or seal black, their limbs are often light colored and some of them have a sort of pattern on their head. Both sexes have horns. They are mainly bred for kid production, and some times for milk. Carpathian goats are from southeastern Europe (including Romania and Poland) and are used for both meat and milk production. They typically have long hair and twisted horns. InRomania they are found in many colors, however the Carpathians found in Poland are usually white. 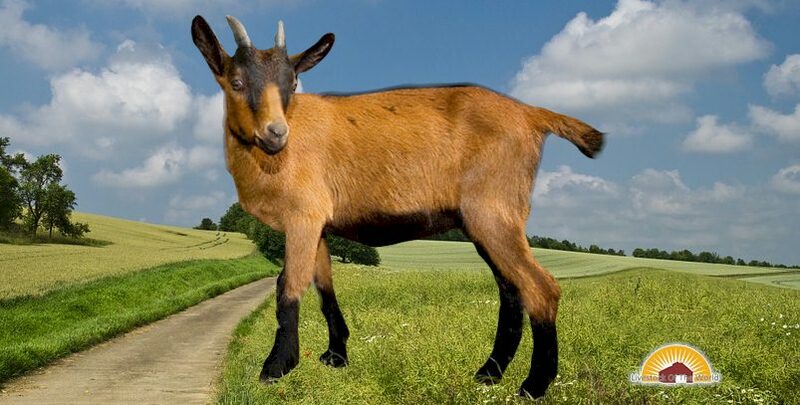 Acashmere goat is any breed of goat that produces cashmere wool. Cashmere wool is a goat''s fine, soft, downy, winter undercoat used for commercial use. The name "cashmere" comes from Kashmir, the wild and mountainous area of India and Pakistan; however, the fiber came from Tibet and was woven in Kashmir. In the 15th Century India, more than 50,000 people were employed in the processing of cashmere. In the 19th Century, a Scottish manufacturer, Joseph Dawson, developed the first mechanical method of separating the fine down fibers in the goat''s fleece from the coarser outer hairs. This breakthrough shifted the cashmere manufacturing to Scotland and the modern era of fine cashmere knitwear began. Chamba Goats are from the Himalayan region, India. They are a sturdy and have soft white hair. They are used to transport products up and down the hilly sides of the region. Chamois Colored Goats are dairy and meat goats from Switzerland. They are brown with black face-stripes, back stripe, belly, and legs. They are either horned or polled. Changthangi goats (also known as or Pashmina goats) are found around Ladakh in Kashmir, India. They are raised for meat and cashmere production and used as pack animals. They are usually white but sometimes that are black, gray, or brown. They have large twisting horns. 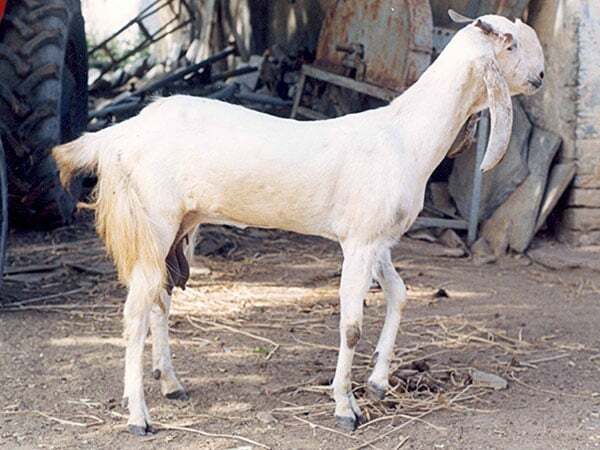 Noori, the world''s first cloned Pashmina goat, was cloned at the Faculty of Veterinary Sciences and Animal Husbandary of theSher-e-Kashmir University of Agricultural Sciences and Technology of Kashmir (SKUAST) in Shuhama, on March 15, 2012. 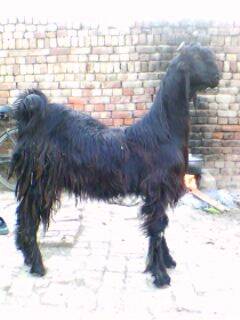 Chappar Goats are small black meat goats from Pakistan. Their meat conformation is considered to be medium to good and they a fairly long hair coat. Charnequeira goats are found in Portugal and they are raised for both meat and milk production. They are usually red but sometimes they are pied. Some are polled and some have wide twisted lyre horns. Chengde Polled Goats are kept for meat and cashmere wool production, and are found in northern Hebei in China. Chengdu Brown Goats are from the Sichuan Province of China. They are a prolific breed kept for meat and milk production. They are brown with a dark face and back stripes. Chigu Goats are fromIndia. They are bred for cashmere and meat. They are white with long twisted horns. 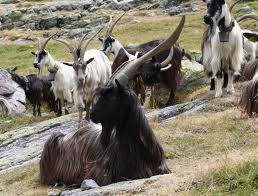 Ciavenasca Goats belong to the alpine group of goats and are from Val Chiavenna (province of Sondrio – Lombardia, Italy) where they are commonly reared. They are very suitable to mountainous grazing. They are 75-80 cm high at their withers. They are variously colored with a short hair coat. They are horned. They are a dairy breed, but they are reared for meat as well (kids and animals to the final stage). A typical by-product is “Viulìn de càvra de Ciavéna” from salted spiced thigh and shoulder, aged for 2-3 months. Content and Photo Source: Agraia.org. Cilentana Fulva are red goats are from southern Italy. They are known for its adaptation to the local marginal conditions (hills and arid soils). They are raised for milk and meat. They are medium-sized. Males are 80 cm high at the withers and weight 55-60 kg; females are 69 cm high and weight 40-45 kg. Ciociara Grigia, or “Two Women Grey”, Goats most likely are from Mount Ausoni and Aurunci, Italy; where a few are still bred. Their coat is plain silver grey, light and dark, long-haired with a grey skin. And they are found with or without horns. They are very good for milk and kid meat. Corsican Goats are from the Frenchisland of Corsica. They are a long haired goat and they are kept primarily for milk production. They come in all colors. 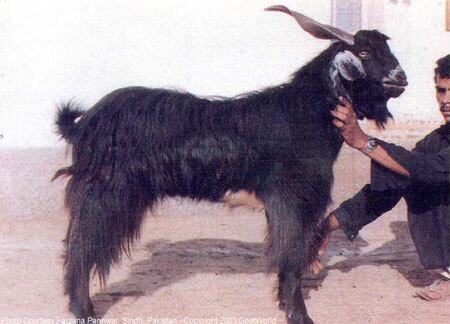 Dera Din Panah goats are from the Multan andMuzaffargarhdistricts of thePunjab province ofPakistan. They have a well-developed body with long black hair, long hanging and twisted ears, and spiral horns. They are used primarily formilk production; their Average daily milk production is 2.5 liters The registered population was reported in 2006 as 142,403. Damani Goats are milk goats found in the Bannu and Dera Ismail Khan districts in Pakistan. They are medium sized with a mature weight of approximately 35 kg. They typically have a long black hair coat with a tan head and legs. The daily average milk production from the does is 1.8 liters. 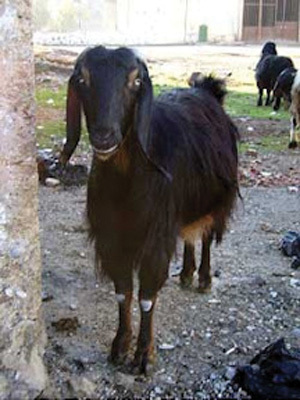 Damascus Goats, also known asAleppo, Halep, Baladi, Damascene,Shami, or Chami Goats are raised in Syria and Lebanon. It is generally used as milking goats. They are of the Nubian type. They have long hair and are usually red or brown but they can also be pied or grey. They may be either horned or polled. ADamascusgoat named Qahr won the first prize for the "Most Beautiful Goat" title at the Mazayen al-Maaz competition inRiyadh on June 13, 2008. The ancestors of today’s Danish Landrace Goats have been in Denmark since 3400 BC, however, this sturdy breed has seen a lot of cross breeding which has left the number of true Danish Landrace Goats rather limited. At the beginning of the 20th century, many were crossed with goats from the German Harz region and Saanen. 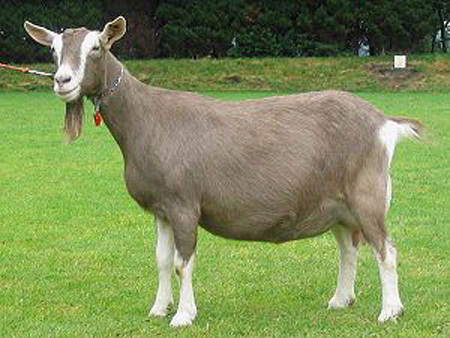 After world war II many Danish Landrace Goats were used as recipients for embryo transfer of Angora or Boer goats or for crossbreeding with Boer goats for meat production. Today most Danish breeders keep small non-commercial herds for home consumption of milk, cheese and meat or for hobby purpose, with the exception of a few commercial milk producers. Dons are a medium-sized goat from theDon river of theLower Volga territory in Russia. They are used for the production ofwool,goatskin, and milk. They were discovered in 1933-34 by an expedition of the All-Union Institute of Sheep and Goat Husbandry that were studying goats in the former Lower Volga territory. They have strong constitution, good conformation and adequate undercoat wool on the body, neck and belly. Their horns are large and variable in shape. Duan Goats are from the Guangxi Provincein China and are used for meat production. They are black, white, or pied. 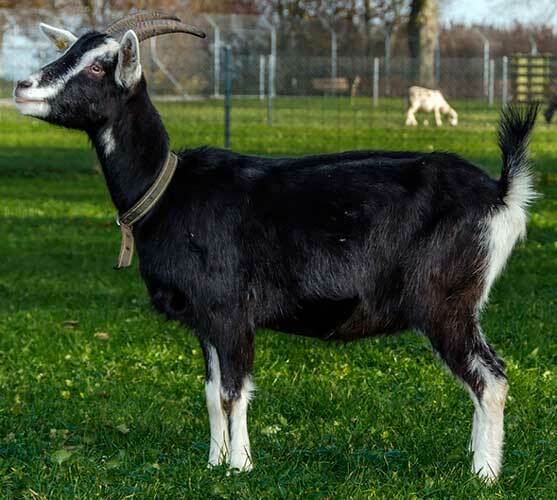 Dutch Landrace Goats are one of the original breeds found in the Netherlands, and they are related to other northwest European "Landrace" goat breeds. They are a medium sized, horned breed preferably with long hair. All colors are allowed except for the typicalToggenburg coloration. In 1958 there were only two left. Those two were bred with very similar goats found in the area. Today the population has increased and there are over a thousand Dutch Landrace Goats kept by members of the L.F.N.L., the Dutch Breeders Association of the Dutch Landrace. Dutch Toggenburg Goats are milking goats thatrnwere developed in theNetherlands by crossing the native Dutch goats and Toggenburg goat. Erzgebirge (also known as Passeirer Gebirgsziege Or Erzgebirgsziege) Goats are native to the Saxony Germany. 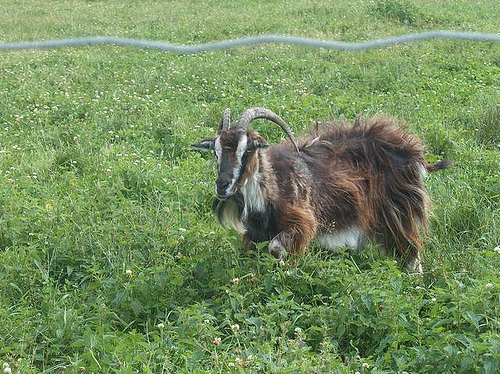 Erzgebirge goats are polled and have a reddish brown coat with black stripes on the face, back, and legs. Primarily used for milking, the breed is critically endangered. 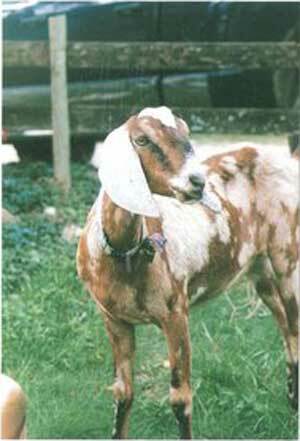 Fasana, or Colombina, medium-sized goats are from Piedmont, Italy. In Austria, France, and Germany are called "Pavone". Finnish Landrace goats are found primarily in western Finland are bred primarily for milk production. They are available both polled and horned. They are usually white but they are sometimes gray or pied. Frontalasca Goats are from Frontale in Val Rezzalo, Italy. They are similar to Swiss Grigionese Goats. They are reared in the Valtellina, Val Malenco, Val Masino, and Valchiavenna, valleys. They have a black coat with white steaks at the sides of their head, bosom, sub-caudal area, and at the limbs toes. They have medium length thick shiny hair and long sabre-shaped horns. They are a dairy breed, but they are also reared for meat as well. A typical by-product is “Viulìn de càvra de Ciavéna” from salted spiced thigh and shoulder, aged for 2-3 months. Garganica, or Fulva Lucchese, Goats represents the typical goat breed of the Ligurian Tuscan and Emilian Appennines, particularly in the provinces of Lucca (Tuscany) and Garfagnana. They were derived from cross-breeding of local animals with goats imported from western Europe, probably at the same time as the importation of Merino sheep that led to the formation of the Gentile di Puglia sheep breed. Garganica medium-height goats are very elegant showy coats. Commonly they are brown, grey, or tawny colored. They have long flowing hair, and are found with or without horns. Their heads are rather small and adults have long, coarse black or dark chestnut hair. The kid skins are prized for their curly, raven-black hair. Girgentana Goats are from Agrigento (also known as Girgenti) Sicily. At one point there were more than 30,000 Girgentana Goats in the hillsrnand coastal zone of the province. However, today the registered population isrnunder 500 goats. Girgentana Goats have unique horns that twistrninto a spiral. They have a long beard and a primarily white coat withrngrey-brown hair around the head and throat. They produce high-quality milk. Goinget, or Göinge, goats originally from Sweden, are not bred for how much milk or meat they produce. Their breeding selection is quite random except for the efforts to not breed animals that are too closely related. This however is not an easy task since all Göinge goats come from the same two pregnant goats found in the area around Tyringe, south of Sweden. 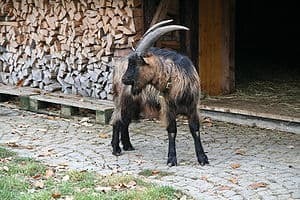 "The Society of the Peasantry Goat" or in Swedish: "Föreningen Allmogegeten" has created a gene bank so they can control the breeding of the Göinge Goat. 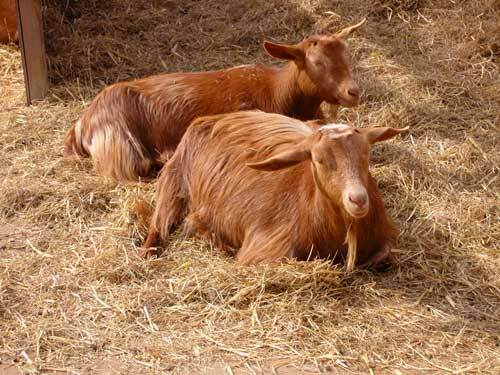 The Golden Guernsey is a rare breed of goat from the Bailiwick of Guernsey on the Channel Islands. 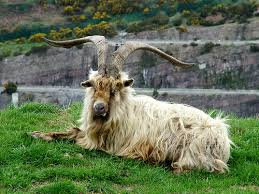 In 1965 the Golden Guernsey was exported to Great Britain and the English Golden Guernsey Club, later to become the Golden Guernsey Goat Society, was formed. Golden Guernsey goats are gold colored, of course, ranging from pale blond to deep bronze. They are smaller and more fine-boned than other British milking goats, and they vary greatly in coat length. The males are sometimes horned but the vast majority are not. They are generally very docile and friendly. The males have been said to be unusually smelly. Grigia Molisana are found in Italy; specifically the provinces of Campobasso and Isernia, Molise Region, especially in the town of Montefalcone nel Sannio. Most likely they are a composite of local breeds, Maltese, Garganica and Alpina. They are medium sized. Females are 70-76 cm high at the withers and weigh 50-65 kg. They Uni colored: white, black, grey, also other colors. They are bred for milk and meat. The Grisons Striped is a tough goat breed from Switzerland and they feel right at home in the mountains. It likes grazing in landscapes that are stony. Hailun Goats are a dairy goat breed found in the Heilongjiang region of China. They are black, pied, grey brown, or yellow. They originated from Saanenand Toggenburggoats crossed with local goats. Haimen Goats are from Zhejiang, China. They are white meat goats known for their prolific reproduction. 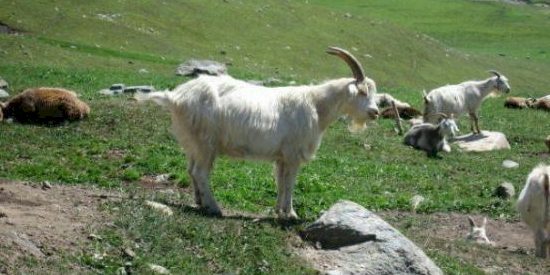 Hasi Goats are the larger mountain version of the Albanian Goats. They are from northeastern Albanian and they are bred for both milk and meat production. They are red and have lop ears. Hejazi Goats are meat goats from Arabia. They are usually black and long haired and used primarily for meat production. The Hexi Cashmere is used primarily in the production of cashmere fiber. Found mainly in China, the largest producer of cashmere down. Hexi Cashmere goats are usually white but sometimes they are black, brown, or pied. The name "cashmere" comes from Kashmir, the wild and mountainous area of India and Pakistan; however, the fiber came from Tibet and was woven in Kashmir. We know that in 15th Century India, more than 50,000 people were employed in the processing of cashmere. Hongtong Goats white milk goats that originated from Saanen goats crossed with local goats. Huai Goats are from Henan region China. They are usually white meat goats and they are found both horned and polled. The Huaitoutala Goat is a cashmere goat from Qinghai, China. Hungarian Improved Goats are milk goats. 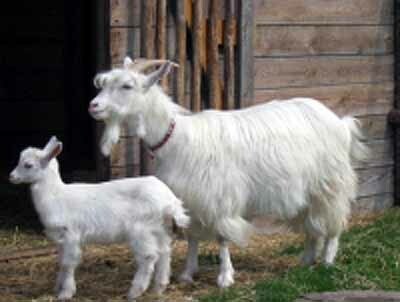 They are descended from selective breeding of local goats crossed with Swiss dairy breeds, especially Saanen goats. They are black, white, red, or cream. Icelandic Goats, also known as Settlement goats, are an ancient domestic goat breed believed to be of Norwegian origin and dating back to the settlement of Iceland over 1100 years ago. Iceland Goats have been isolated for several centuries, which mean that they are highly inbred. Under their coarse, long guard hair they have a coat of high quality cashmere fiber. Icelandic goats are kept mainly as pets and currently have no economic value. 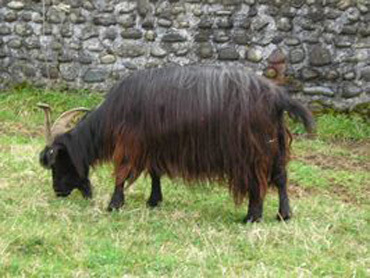 Irish Goats are long-haired goats from Ireland used for milk, meat, and skins. Although not native to Ireland, domesticated goats have long been raised in Ireland. In many areas feral populations have become established as a result of escapes or deliberate releases from captivity. Iris Goat populations have persisted in remote and rugged areas which they are ideally adapted - Irish Goats are nimble-footed on crags and precipitous cliffs. They range widely in colors; however, they are usually a mixture of grey, black, and brown. Both genders have horns, but the males have larger horns. 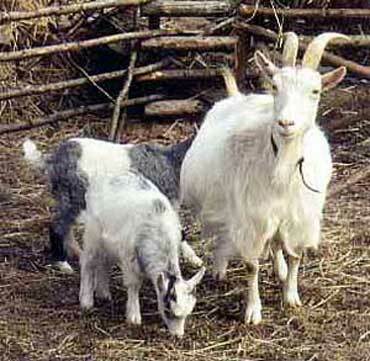 Istriana Goats come from Istria (once belonging to Italy), and have been crossbred with alpine breeds. They are bred in the province of Gorizia, (in 1983 there were just over 100 heads). They have plain white coats and are a dairy and meat breed, the kids are slaughtered at 10-15 kg. Content and Photo Source: Agrarian.org. 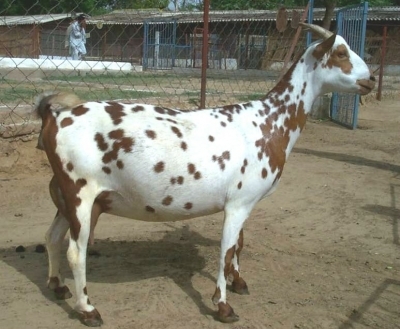 Jamnapari (or Jamunapari) goats, ancestors of the American Nubian, originated in Indian and are bred for both milk and meat. Since 1953 they have been imported to Indonesia (popular as Etawa goat, and its mixture with a local goat called "PE", Peranakan Etawa or Etawa mix) where they have been a great success. The name is derived from the rivers Yamuna, Jamuna (West Bengal) and Jamuna (Bangladesh) of India and Bangladesh. In India there were an estimated 580,000 of the breed in the 1972, although less than 5000 were thought to be purebred. Jining Grey Goats are from the Shandong Province of China, where they are used for kid pelt and cashmere fiber production. They are known for the attractive wavy patterns of its kid-pelt. 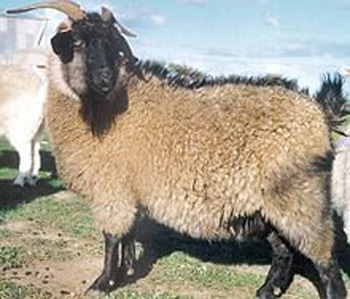 Well-raised Does raised reached maturity at 3-4 months of age, and may give two kiddings a year, or three kiddings in two years. They are very prolific, with an average kidding rate of 294 percent. Both genders have horns and carry a forelock. Their color patterns vary between black, white or black and white. They are a small bodied goat with the males weighing approximately 33.2 kg (~75 lbs) and the females 25.4 kg (~56 lbs). Jonica Goats are a domestic goat from the province of Taranto, in southern Italy. 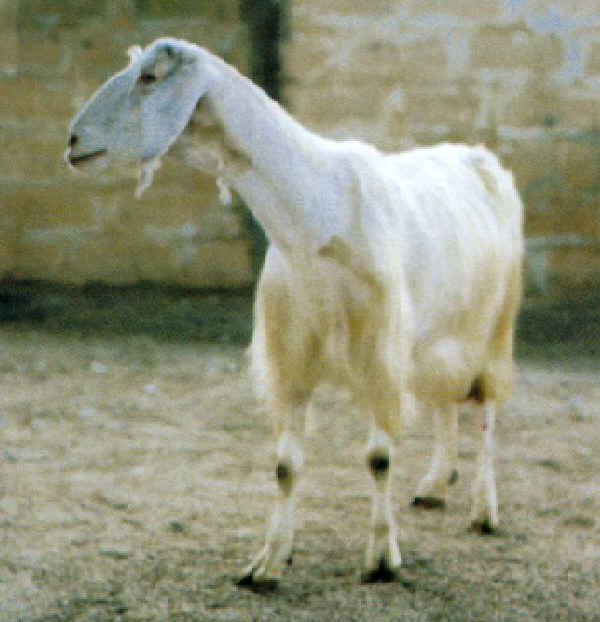 It is thought that Jonica Goats originated from the crossing of local varieties with Maltese goats. Jonica Goats are one of the eight autochthonous Italian goat breeds for which a genealogical herdbook is kept by the Associazione Nazionale della Pastorizia, the Italian national association of sheep-breeders. In 2013 there were 232 registered Jonica Goats. Kaghani are large goats from the valley of the Hazara district of Pakistan. They are used for cashmere fiber and meat production. They are white, gray, brown or black. Their meat conformation is considered to be medium to good. Kaghani goats yield a good crop of long hair (per head/year 2 kg) with an under coat of cashmere wool used for expensive pashmina fabrics. Kalahari Red goats are red meat goats from the Kalahari Desert in South Africa. Kalbia goats are a meat goat from Australia. Kamori goats are a popular breed of milk goats found in the districts of Dadu, Larkana and Nawab Shah in the Sind Province, Pakistan. They are famous because of their long ears and huge body, also for their unique color. 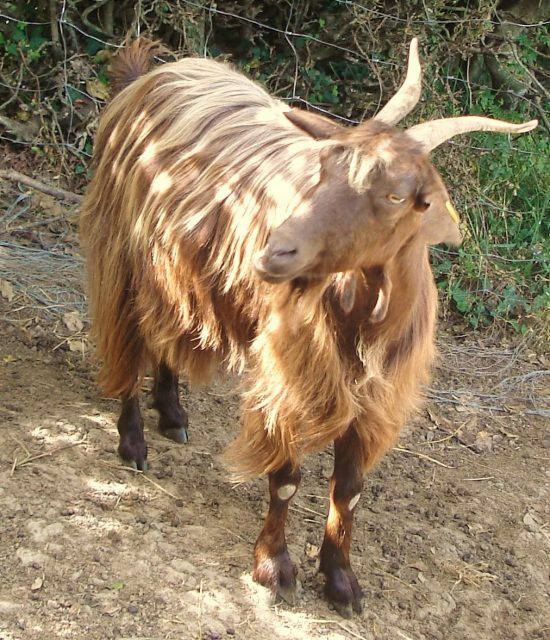 A purebred Kamori goat has dark brown color with coffee or dark faun color small patches over its entire body. The Kinder Goat breed began in the late summer of 1985, when Zederkamm Farm''s Nubian buck died, leaving two Nubian does without a mate. 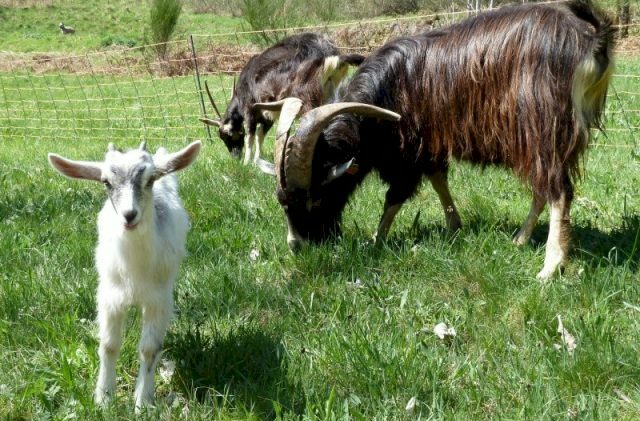 Since they also kept pygmy goats and did not want to take the does to another farm to be bred, they were bred with their pygmy buck. Left to his own devices, the buck accomplished the two successful breedings, making use of log sections and sloping land to reach the correct height. On 30 June and 4 July 1986, the first three Kinder does were born. It was another year before the first Kinder buck was born. 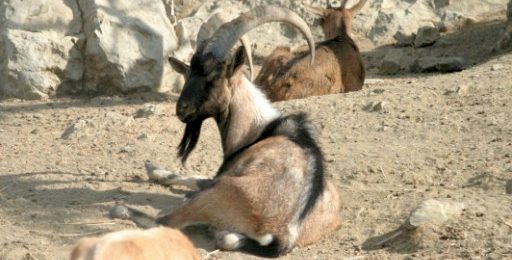 The Kri-kri, also known as the Cretan, Agrimi, or Cretan Ibex goat, are feral goats that are found in the Eastern Mediterranean, specifically only the island of Crete and three small islands just offshore (Dia,Thodorou, and Agii Pantes). 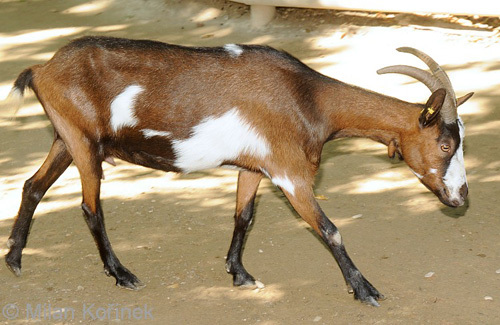 Kri-kri Goats have a light-brownish coat with a darker band around their neck. They have two horns that sweep back from their head. In the wild they are shy and rest during the day. They can leap impressive distances and climb seemingly sheer cliffs. 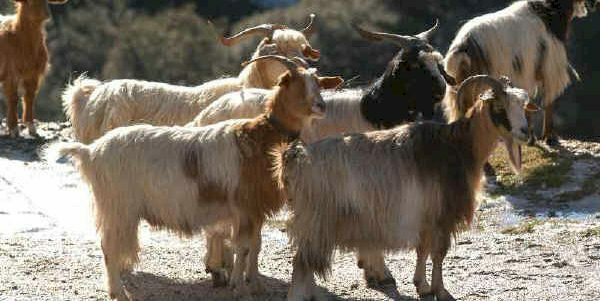 Kri-kri Goats are not thought to be indigenous to Crete. Most likely they were imported during the time of the Minoan civilization. However, they are now found nowhere else. L’Aquila Goats are from the province of L''Aquila, Italy. They are a composite of local breeds, Toggenburg from Switzerland, Alpine, Maltese and Girgentana. They are medium sized (males are 75-80 cm high at the withers and weight 70kg, females are 65-70 cm high and weigh 55-60 kg) . They are uni-colored: black, brown, white, also other colors. They produce 230-300 kg milk per lactation. 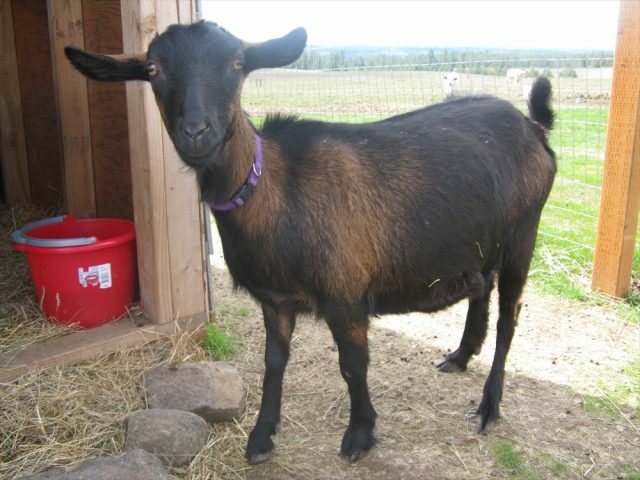 LaMancha Goat originated in US state of Oregon by Mrs. Eula Frey. She combined short-eared goats of a type found not only in LaMancha, but throughout spain. LaMancha Goats have excellent dairy temperament and are an all-around sturdy animal that can withstand a great deal of hardship and still produce. Through official testing this breed has established itself in milk production with high butterfat. LaMancha faces are straight with distinctive short ears. They have either a gogher ear or an elf ear. Lariana Goats, or the Goat of Livo, comes from the western side of Como Lake, from Livo valley, Italy. They belong to the European alpine Group of Goats. They are found in Italy across in western Lario and nearby areas. Their coat is variously colored: plain–black, brown, red or yellow – or pied. Horns: present or absent, ibex-like or ‘markar’, that is, backwards and wide apart. Although their milk production is quite good, they are mainly reared for kids. Loashan Goats are dairy goats from the Shandong Province of China. 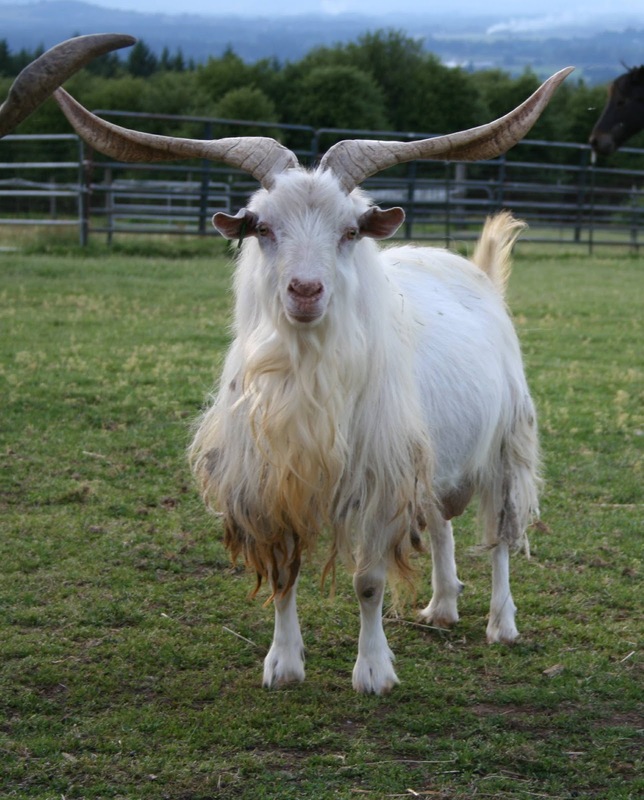 They were developed by German preachers in 1904 by the selective breeding of local goats crossed with Saanen Goats. They have been improved by upgrading and selection during the past 70 years, and they are now similar to purebred Saanen in both body and conformation and milk production. The Cabra Majorera or Fuerteventura Goat is a breed of dairy goat from the Canary Islands. Majorero cheese is made from its milk. 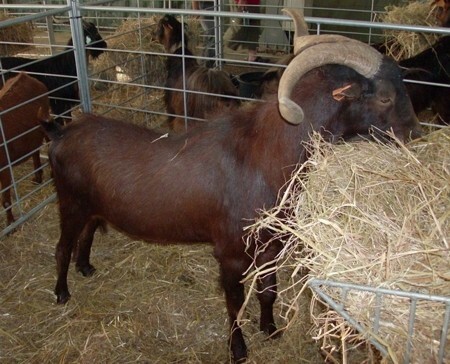 Majorera Goats are a particularly strong breed, and they have been exported to Africa and Latin America. Maltese Goats are dairy goats from the east and central Mediterranean area. They originated in Asia Minor, and they get their name from the island of Malta, although the officially there are no pure-bred specimens of the breed in the Maltese islands. They are raised mainly in southern Italy, and particularly in the islands ofSicily andSardinia. They are also found in Greece, Turkey,and the Maghreb. 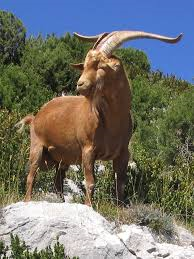 Massif Central Goats are from the massif central area of France. Massif Central is an elevated region in south-central France, consisting ofmountainsandplateaux. Massif Central Goats are large, stocky goats with generally long hair on their backs, thighs and under belly. Traditionally the animals without horns were preferred. Messinese Goats are a dairy goat from the Monti Nebrodi and the Monti Peloritani area in the province of Messina, in the Mediterranean island of Sicily, in southern Italy. They are also found in the provinces of Catania, Enna, and Palermo. The breed was officially recognized and a herd-book established in 2001. It was previously known either as the Capra dei Nebrodi or in general as the Siciliana Comune. 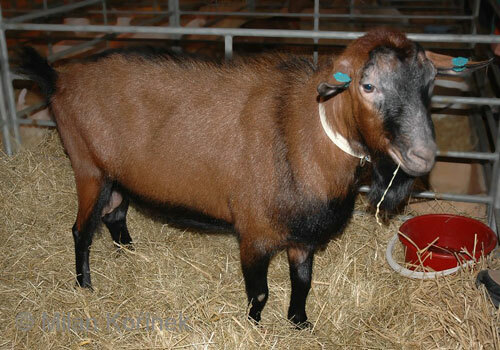 Mini Oberhasli, also called anOberian, and formally called Miniature Oberhasli, Goats are dairy goats that were created by breeding a Nigerian Dwarf with an Oberhasli Goat. 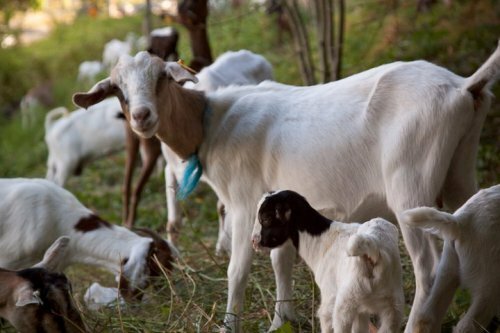 Mini-Oberhasli Goats produce from 4 to 10 pounds of milk per day. Mini LaMancha goats are the Miniature version of LaMancha Goats: the only breed developed in America. Mini-LaManchas are well known for their docile, even temperament and a steady production of fairly high butterfat. Does are up to 27 inches tall and bucks up to 29 inches tall. Their face is straight with distinguishing ears; they are either ''Gopher'' which lack cartilage but do have a ring of skin around the auditory canal or the ''Elf'' which has some cartilage and should be no longer than an inch long. In does, both ear types are equally accepted but bucks must have ''Gopher''; ears to be registered. Bucks with elf ears are registered as "Experimental". Mini-Nubian Goats are a mid-sized goat and are a cross between Nigerian and Nubian goats.They are known for being a graceful, elegant goat that stand between 23-31 inches tall and come in any color or pattern of short, fine, glossy hair. They are know for their ease of milking; producing a high quantity and quality of milk whose butterfat yield is similar to that of the standard Nubian. Breeding programs put emphasis on a structurally correct animal with well-attached udder that milks with ease. As this breed was originally designed for small farms and homesteaders who milk by hand and needed a smaller animal for handling and feeding purposes. Miniature Silky Fainting Goats are a unique breed of goat. They are smaller and somewhat easier to care for and maintain than larger meat goat breeds, which makes the fainting goat desirable for smaller farms. 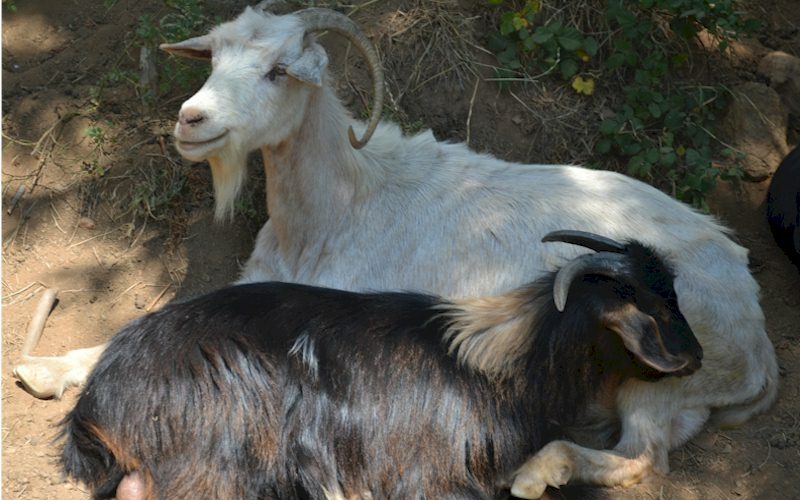 Fainting goats have many other names, including Myotonic Goats, Tennessee (Meat) Goats, Nervous Goats, Stiff-leg Goats, Wooden-leg Goats, and Tennessee Fainting Goats. Although Miniature Silky Fainting Goats are listed as a meat breed, the primary goal is to have a beautiful, silky-haired goat to show. Meat is not a goal of this breed. While good conformation is expected ~ this breed is predominately about the silky coat. They are generally friendly, intelligent, easy to keep, and amusing. Montecristo Goats, or the Goat of Montecristo, are spread across the isle of Montecristo (Tuscany, Italy). They are not local but they are derived from Roman goats of medieval times, then crossbred with domestic goats. They have now grown wild and no longer applied for production. They have typical wild coat shading from light brown to varied reddish, bearing a pattern on the head and a dark dorsal line. They are short-haired and have well developed horns in both sexes. Monticellana Goats come from a goat present in Latium at the beginning of the XXth century, they are also called ‘Bianca Romana’. In the area of Monte San Biagio (Province of Latina – Latium) there are about thirty breeders owning one thousands heads. They have white coats with white-rosy skin; both sexes bear horns. 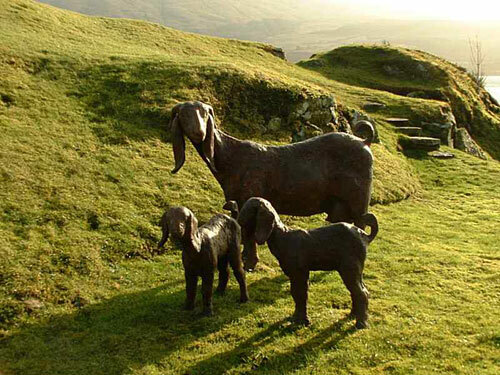 They are a rustic breed, reared either for milk (used to make cheese) or for meat (kids). The Mountain Goat (Oreamnos Aamericanus), also known as the Rocky Mountain Goat, is a large wild goat found only in North America. They are a sure-footed climber commonly seen on cliffs and ice in sub-alpine to alpine regions. Moxotó Goats are found in northeastern Brazil. They are white or cream with black face-stripes, back-stripe, and belly. Murcia-Granada Goats originated in southeast Spain (Murcia, Almería, Granada, and Alicante). They are raised for high-performance and for its excellent milk production. Murciana Goats, also called Murcian, Murcien, Murciene and Royal Murciana Goats are a used for both milk and meat production. They originally are from the Murcia province - along the Mediterranean coast of southeastern Spain. While they have shorter ears than many goat breed, Murciana Goats have an ear that is shaped like those of the Swiss breeds, such as Alpines, Oberhaslis, and Saanens. 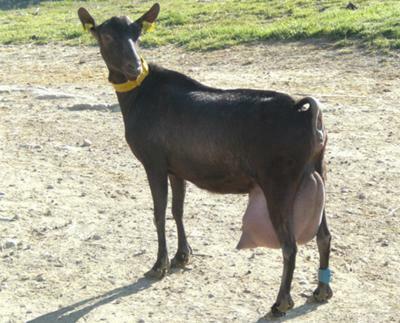 Murciana Goats are excellent milk producers. Their milk is especially rich in butterfat. Murgese di Foggia Goats were from the province of Foggia, Italy. Most likely they are extinct. Myotonic Goats, also known as Wooden Leg, Stiff Leg, or Tennessee Fainting Goats are one of the few goats that are indigenous to the U.S. There are two strains of this animal. Most of those found in Tennessee and the eastern U.S. are smaller. Most Texas herds tend to be somewhat larger, probably due to selective breeding for the meat market. In fact, some ranchers have renamed them Tennessee Meat Goats. 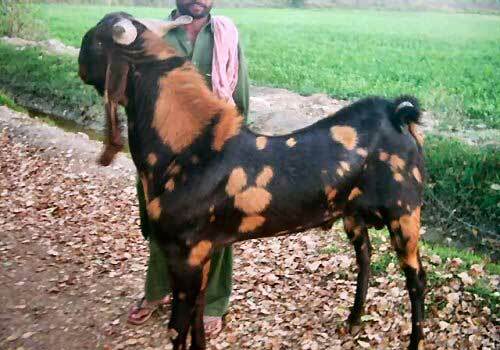 Nachi Goats are a meat goat that is found in the Jhang, Multan, and Muzaffargarh districts in the Punjab Province of India. They are medium sized and are black or brown. Their meat conformation is considered medium. They have short and rough hair, small twisted horns, and a dancing gait. Napoletana Goats are from Naples, Italy. Their numbers have decreased in the latest decades. Their coat is black with limited light red areas or dark red with lighter areas; short hair. They have small sickle-shaped horns. They used to be reared mainly for fresh milk. Kids slaughter at 9-12 kg. Nicastrese Goats come from Nicastro area, which today is Lamezia Terme, Italy, at the foot of Mount Reventino. They are bred in the province of Catanzaro and because of its good economic features they have spread to nearby provinces. They have a black coat with white bosom and limbs, as well as part of the head and possibly the sides; long smooth hair in females, tougher in males. Their horns are usually present in both sexes. They are reared for both milk and meat. 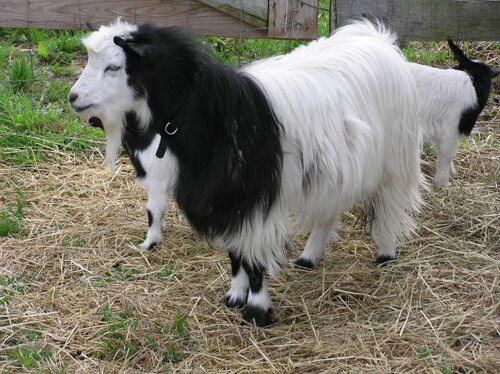 Nigerian Dwarf Goats are miniature dairy goats from West African. They were originally brought to the United States on ships as food for large cats such as lions, the survivors originally lived in zoos. 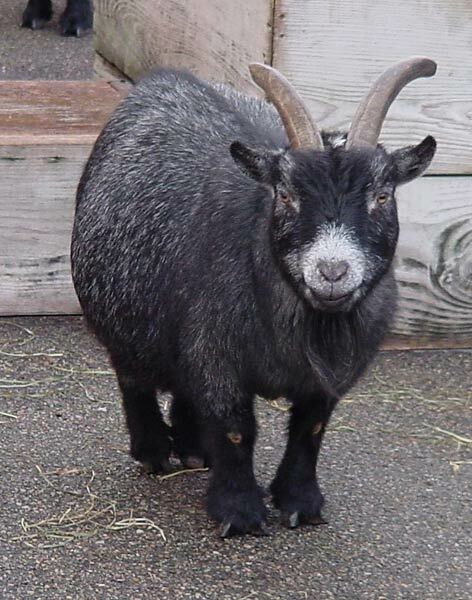 Nigerian Dwarf goats are popular as pets and family milkers due to their easy maintenance and small stature. However, because of their high butterfat, they are also used by some dairies to make cheese. 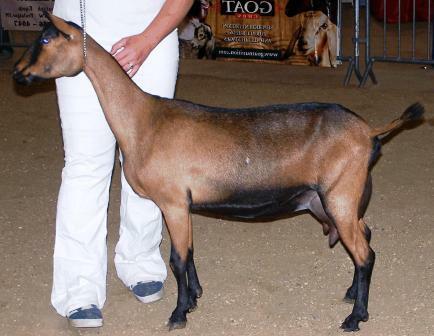 Nigerian Dwarf Goats are registered by the American Dairy Goat Association, the American Goat Society, and the Nigerian Dwarf Goat Association. 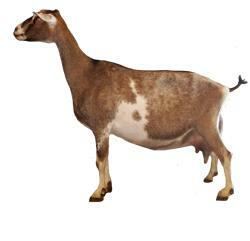 Nigora Goats are medium-sized (19in to 29in tall) milk and fiber goats. Nigora Goats are generally calm, amiable, and laid back. Due to their good nature and size Nigora Goats are sold as pets, and well as milk and fiber animals. Nigora Goats originated in the United States in the early 1990s. 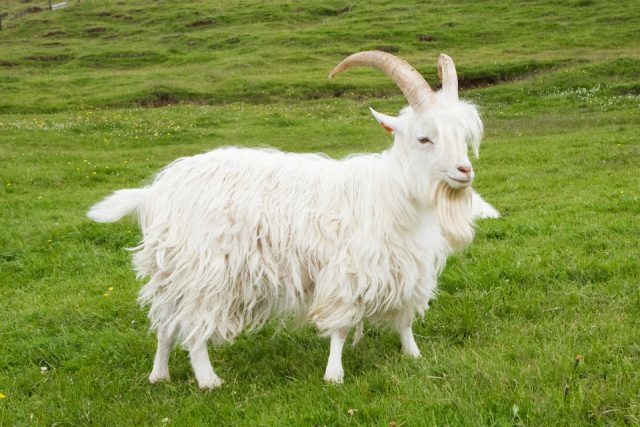 Early Nigoras contained a mixture of Nigerian Dwarf, white and colored Angora goat bloodlines, as well as some small grade fiber goat breeding; today''s Nigoras may also contain the bloodlines of registered Swiss type Mini Dairy breeds. Norwegian Goats are, yes you guessed it, from Norway! They are a long-haired goat and they are used for both milk and meat the production. They are gray, blue, white, or pied. 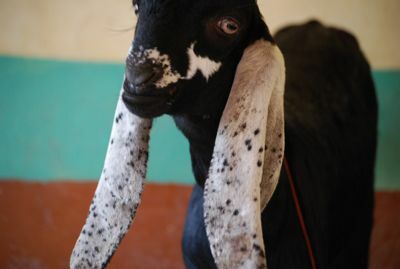 The Nubian, or Anglo Nubian, is an all-purpose goat, useful for meat, milk and hide production. 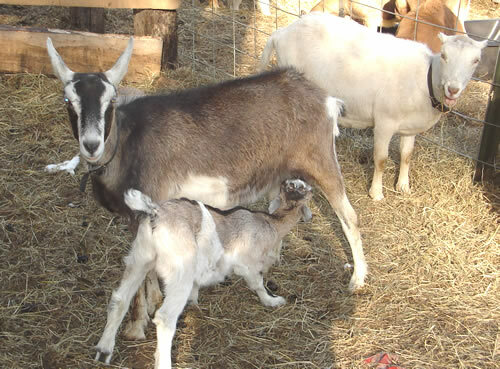 Nubian goats are known for the high butterfat content of their milk, although on average, the breed produces less milk than other dairy breeds. Nubian goats are named for Nubia, in northeastern Africa. 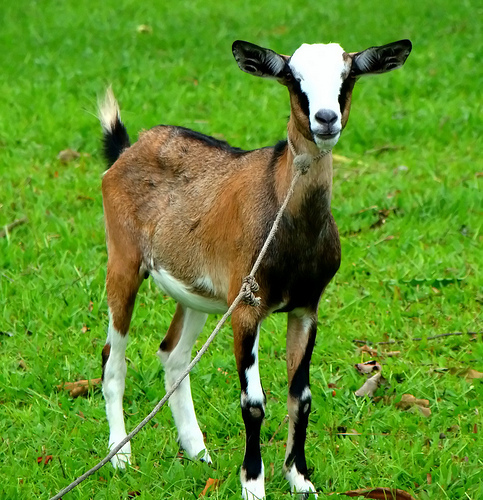 The originally goats imported from Africa, Arabia, and India were long-legged, hardy goats that had some characteristics desired by goat breeders in England. English breeders crossed these imported bucks with the common short-haired does of England prior to 1895 to develop the Nubian goat. 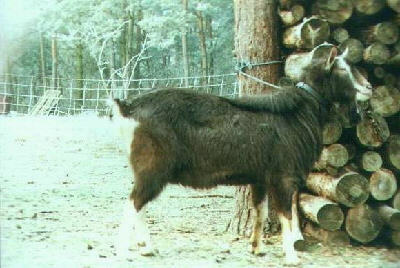 Oberhasli Goats are a medium-sized dairy goat. Oberhasli Goatsare Chamoisee- colored, ranging from light to a deep red bay with black facial stripes, muzzle and forehead. Oberhaslis can also be black in color. Orobica, or Valgerola, Goats are a medium-sized goat from the Val Gerola in the province of Sondrio, in the Bergamo Alps of northern Italy. The origins of Orobica Goats is unknown; they were first documented at the beginning of the twentieth century. The Orobica is one of the eight autochthonous Italian goat breeds for which a genealogical herdbook is kept by the Associazione Nazionale della Pastorizia, the Italian national association of sheep-breeders. At the end of 2013 the registered population was only 274. Pedula della Valtellina are medium-large Goats from Valtellina, Valmalenco, and Valchiavenna Italy. They have feature Alpine Goats. 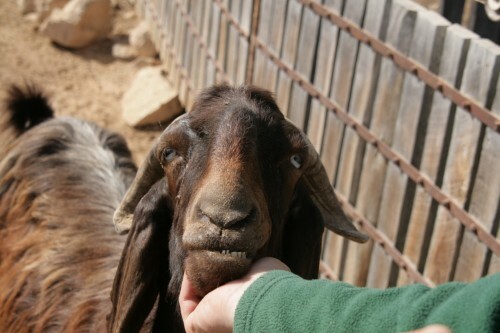 They are a dairy goat with a gentle temperament. Their coat is made up of short thick beige hair shading to grey and peculiar black streaks on the head and on the toes, in the sub-caudal area and on the breastbone. There are two types: the classical type with black chamois shades and a second type (Mogna) with white or whitish shades. They have sabre-shaped horns in both sexes. Pezzata Rossa Goats most likely are related to Neapolitan Goats. They are a dairy goat and they are found around a vast area in many provinces of Campania, Italy. Their coat is usually red pied with irregular edges. Sometimes they have a white face mask. Both sexes bear horns. 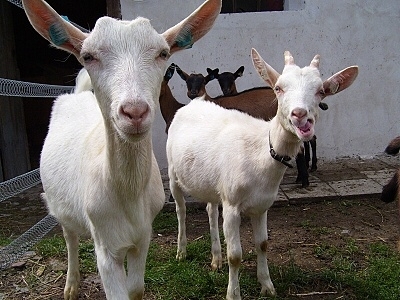 There are two varieties of Philippine goats raised for meat production. There is a coarse-haired type that is cream, tan, or light brown and they are usually polled. 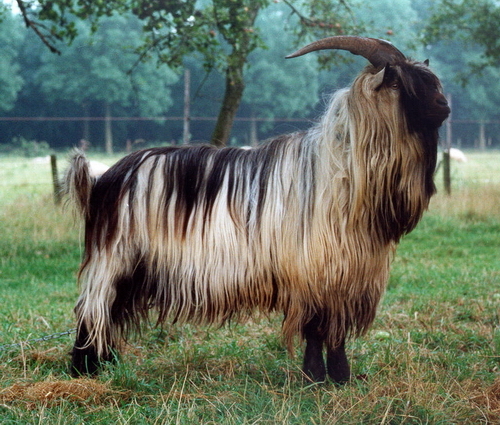 The other is a fine-haired horned variety which is black or brown and may have a white belt. These goats are thought to have originated from the Katjang breed. 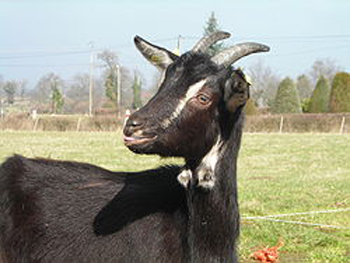 Poitou goats are a rare dairy breed from western France. They are usually polled and have long hair coats. They are black-brown with a pale underbelly and legs. Pomellata Goats are from the Campania region of Italy. Potenza Goats, or Capra di Potenza “Power Goats”, are from the Potenza, Province of Italy. They are derived from local breeds (Cilentana, Garganica and probably Girgentana Goats). They are adapted to the local environment (hills, where arid soils are predominant). They uni colored: grey, black, brown, also other colors. They have large horns. They produce 300-350 kg milk per lactation. Pygmy Goats were originally called the Cameroon Dwarf Goat since they originated in the former French Cameroon area. They are mostly found in West African countries. Similar forms of Pygmy goats also are found across northern Africa, southern western African countries, and in east Africa. 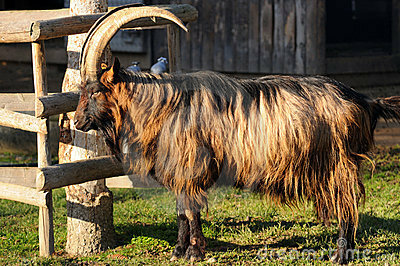 The Cameroon goats were exported from Africa to zoos in Sweden and Germany where they were on display as exotic animals. The first Pygmys probably arrived in the United States in 1959 from Sweden. Pygmy goats have a full coat of straight, medium-long hair which varies in density with seasons and climates. Most often they have a grizzled (agouti) pattern produced by intermingling of light and dark hairs, of any color. Pygora goats are a breed of fiber goat that originated from crossing Pygmy Goats and Angora Goats. The Pygora was a purposeful cross, bred by Katharine Jorgensen of Oregon City, Oregon. In 1987, the Pygora Breeders Association was formed in the United States, and has since then been registering and promoting Pygoras. 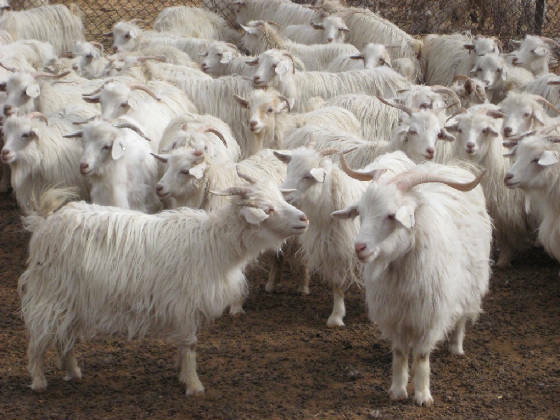 Today, the registered Pygora goat may not be more than 75% AAGBA-registered Angora goat or 75% NPGA-registered Pygmy goat. Pygora are mainly for producing fiber, but some people also show them as a hobby, in fairs, fiber shows, and in 4H. Some pygora breeders and 4-H clubs show goats at the Oregon Flock and Fiber Festival (OFFF). Pyrenean Goats are from the Pyrenees of France and Spain and the Cantabrian Mountains of Spain. They are bred for both milk and meat production. They are usually dark brown or black with a paler belly and feet. The Pyrenean can be either polled or horned and usually has long hair. Qinshan Goats are black goats from Jining, Shandon, China. They are raised for their pelts. 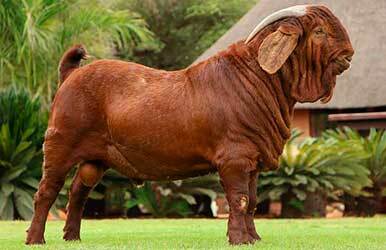 Red Boar Goats are a meat goat from South Africa. They also are used as pets. Red Mediterranean, or Rosa Mediterranea, Goats originally came from central-eastern Mediterranean, particularly Syria. They have a reddish-brown coat. They are mainly bred for milk for making cheese. Rossa Mediterranea, or Derivata di Siria, Goats are from the Mediterranean island of Sicily, in southern Italy. They were derived from Siria or Mambrina, Goats. They are raised mainly in Sicily, but also in Basilicata and Calabria in southern mainland Italy. 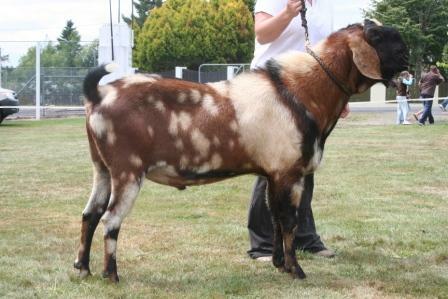 Rossa Mediterranea Goats are a milk breed. Their milk production is approximately 570 kg with an average of 4.11% fat and 3.53% protein, and is used predominantly forcheese-making. 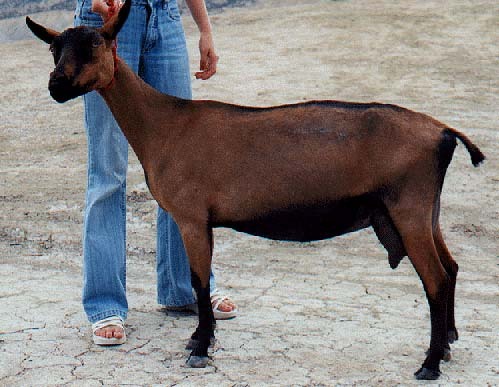 Repartida Goats are from northeastern Brazil selectively bred from the Chué goat. Like its progenitor, it is a meat-type breed. The breed has black forequarters and brown or pale hind, and vice versa. Roccaverano Goats are considered an autochthonous breed of Alta Langa Val Bormida, Italy, and the most diffuse goat breed in that area; most likely it belongs to the Alpine group of Goats. They have long-haired coat with a great variety of colors (beige, black, white or brown) either plain or pied. Usually they do not have horns. Mainly they are used to produce milk used to make Robiola of Roccaverano cheese. 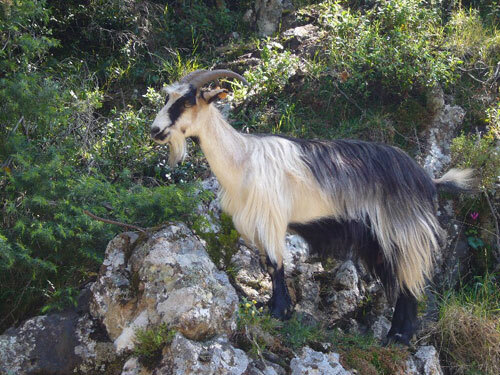 Rove Goats were first domesticated in Le Rove, France near Marseille. They were once considered endangered, but as of 2003, there are more than 5000 registered Roves on French farms. The goat was originally bred for meat, but because the current French market for goat meat is poor, farmers have begun to use the Rove for dairying, instead. Rove Goats are primarily characterized by its long twisted horns. They can reach nearly 4 ft in length. 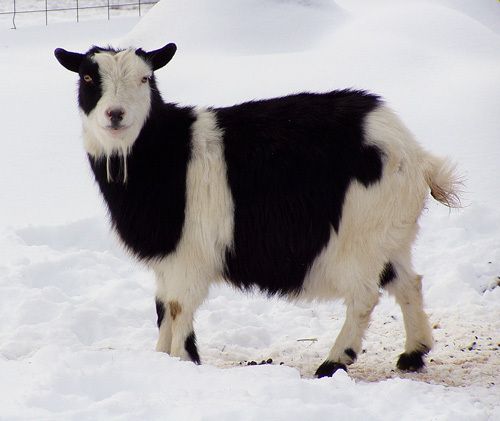 The goats have a smooth coat often in red or black, but also in ash gray, red speckled with white, red mixed with gray, black with tan markings under the eyes and nose or red and black. Russian White Goats are, unsurprisingly, white goats from Russia. They are dairy goats derived from the selective breeding ofSaanenand Toggenburg goatsimported from Switzerland, crossed with various native goat breeds of the former USSR. Rustica di Calabria Goats are an Italian breed reared in the province of Cosenza (Calabria). They have heterogeneous features; probably they have been mixed with Maltese and Garganica Goats. After rearing in the mountains, they are brought to lower altitudes during the winter. Their coat is variously colored, white, brown or black; with or without horns. They are used for both milk and meat production (kids slaughter at 6-7 kg). Saanen Goats are dairy goats that originated in Switzerland, in the Saanen Valley. By the late 19th century they had spread across Europe, and in the early 20th century were brought to the US. 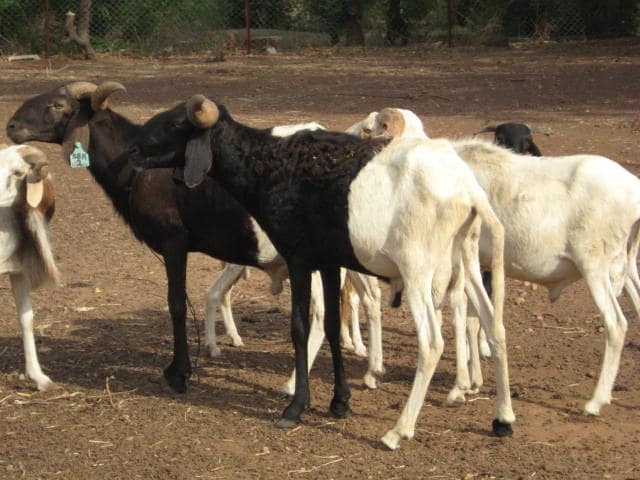 Now they are among the most popular dairy goat breeds, due to their high productivity and ease of management. Saanen does are heavy milk producers and usually yield 3-4 percent milk fat. They are medium to large in size (weighing approximately 145 lbs/65kg) with rugged bone and plenty of vigor. 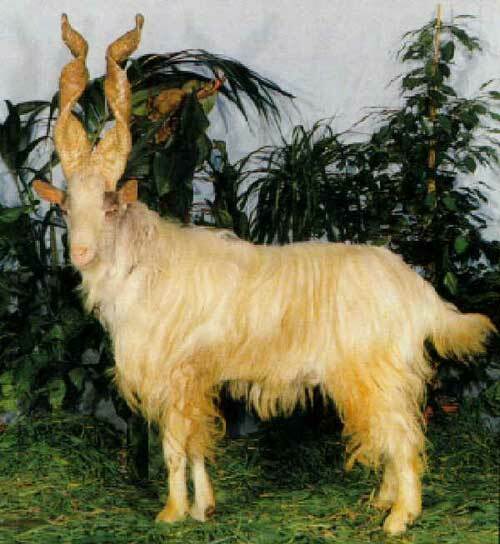 Sable Saanen Goats are descended from Saanen goats brought to America by Europeans. In 2005, the Sable was recognized as a separate breed. Before they were recognized as a separate breed, they were often culled. They are color variations of Saanens due to a recessive gene; they are sometimes referred "the Saanens in party clothes". Sables can come in a variety of colors, including black, brown, and grey. They may have white colorings, but are not permitted to be solid white, as that would be no different from a normal Saanen. Sables are recognized by the American Dairy Goat Assiocation (ADGA). Sahelian Goats are from West Africa, especially in north and northwest Mali. They are used for the production of meat, goatskin, and very rarely milk. Sahelian Goats belong to the Savanna group of goats with many types and subtypes raised in the Saharan and sub-Saharan region. They have a thin appearance, narrow body, shallow chest, and sloping short croup. Both genders are horned, most (70%) with wattles, pendent or semi-pendulous ears. Average females weight about 55-75 pounds, height in withers 65-75 cm, heart girth 62-78 cm, males about 85-125 pounds, 65-85cm in withers and 70-85 cm. in heart girth. Salerno Goats are from Salerno province of Italy. They are uni-colored black or brown. They yield 250 kg per lactation. 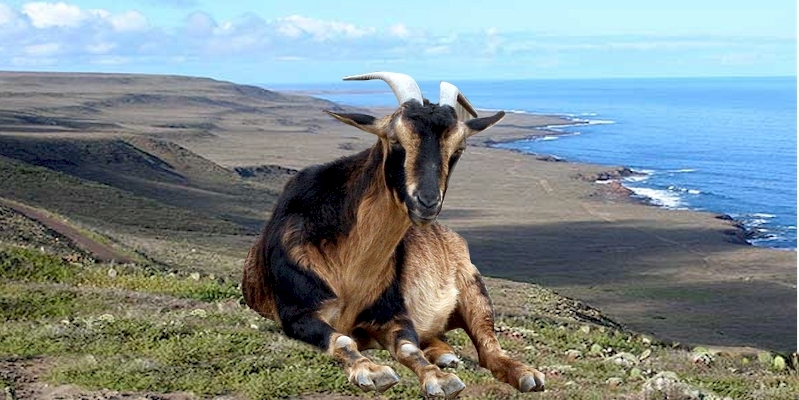 San Clemente Island Goats are derived from feral goats isolated on San Clemente Island, one of the Channel Islands off the coast of California. They are thought to be descended from goats brought to the island by Spanish missionaries and settlers; breeds such as the La Blanca Celtiboras, the La Castellana Extremenas, and later the more common dairy and meat goats of Spain, the Malaguenas and Murcianas. The U.S. Navy became responsible for the island in 1934. Hunting and trapping were allowed, but in 1972, when a survey concluded that there were 11,000 goats on the island, a systematic removal program was begun. By 1980 an estimated 4,000 goats still remained on the island. Sarda Goats are from the Mediterranean island of Sardinia, off the west coast of central Italy. They are raised throughout the island, particularly in the provinces of Cagliari and Nuoro. They are an ancient breed that has been influenced by the Maltese goat. 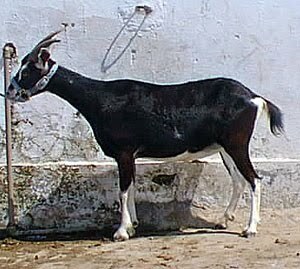 Sarda Goats are of medium build, long-necked, and deep-chested. The does have well-developed udders. The breed is particularly hardy and well-suited to being raised in a wild or semi-wild state in tough conditions. Savanna Goats are a high-quality white meat were developed from native South African goats. For years various south African farmers bred what was then known as white Boer goats for a number of years in South Africa. One of the advantages of these white goats was the fact that the white color is dominant over most other colors. The other reason is that there is a big demand for white goats for slaughter purposes for various reasons. Screziata Goats are from the Campania region of Italy. Some exemplary Selvatica di Galite Goats are raised near the ConSDABI (Consortium for Experimentation, Divulgation and Application of Innovative Biotechniques), Circello, Benevento. Some exemplary Selvatica di Joura Goats are raised near the ConSDABI (Consortium for Experimentation, Divulgation and Application of Innovative Biotechniques), Circello, Benevento. Some exemplary Selvatica di Samotracia Goats are raised near the ConSDABI (Consortium for Experimentation, Divulgation and Application of Innovative Biotechniques), Circello, Benevento. Sempione Goats are autochthonous Goats from Alta Ossola, Italy. They are at serious risk of extinction (fewer than 100 heads). Suitable to mountainous rearing. Their coat is white, sometimes brown, with long hair all over the body. They have a beard and well developed horns that turn backwards in males, shorter in females. These goats are reared for kids of about 10-12 kg. 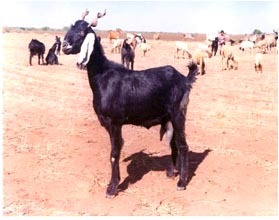 Somali Goats are found in Somalia and northeast Kenya. They are used primarily for meat production. They have short ears and hair, usually white but sometimes with spots or patches. Both males and females have horns, although females are often polled. The goats are drought tolerant and, when milked, can each yield one to three kilograms of milk daily, even when access to water is limited. Spanish Goats, also called brush goats or scrub goats, came originally from Spain via Mexico to the USA. They are now a meat and brush-clearing type found widely in the United States. In the Southeast and elsewhere, they are often referred to as "wood" (Florida), "brush" or "briar" (North Carolina, South Carolina), "hill" (Virginia), and "scrub" (midwest Pennsylvania) goats. Until recently, these goats were kept mainly for clearing brush and other undesirable plant species from pasture lands. SRD Goats are from northeastern Brazil and are a meat breed. The name stands for Sem Raca Definida, meaning without defined breed. Stiefelgeiss Goats is a meat goat from the highlands of St. Gallen, Switzerland. Their population is currently less than one thousand. 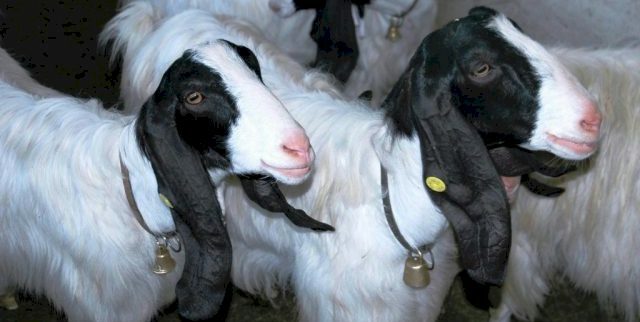 Both male and female Stiefelgeiss goats have horns. Their coats range from a light greyish brown to a dark reddish color. The animals are not excessively shaggy, but on the animals'' hind end, long beard hairs, called "Mänteli," grow much longer and often are of a different color from the rest of the coat. Some members of the breed display long, beard-like hairs on the chin. 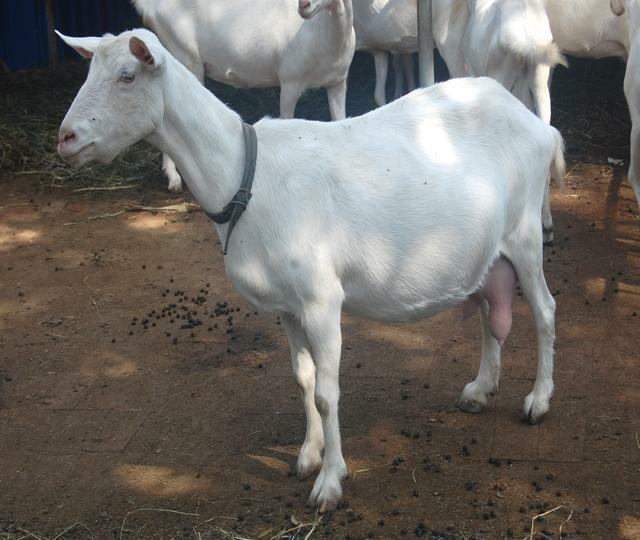 Surati goats are is a popular milk goat breed from India. They are white and medium sized. Their ears are of medium size and both females and males have tiny horns. Swedish Landracegoats are from northern Sweden. They are used for milk production, which is used to make cheese. Tauernsheck goats are from Austria and are for the milk production. 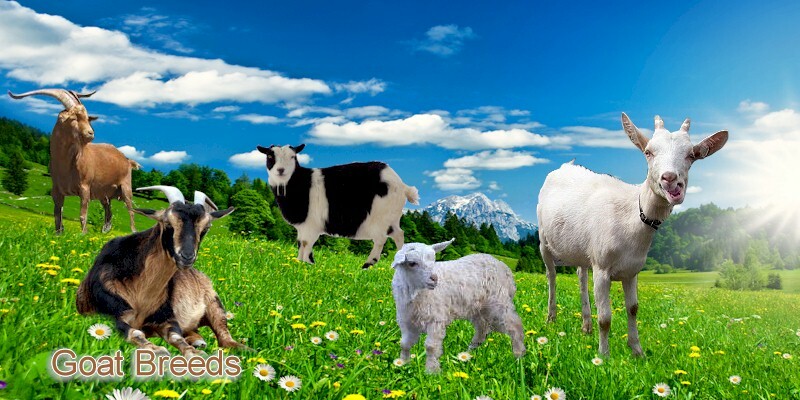 They are a very rare breed of goats derived from the Austrian Landrace and Pinzgauer goat breeds. Capra di Tavolara are brown goats from the island of Tavolara, Italy. They are related the wild goats. Some exemplary of this race are raised near the ConSDABI (Consortium for Experimentation, Divulgation and Application of Innovative Biotechniques), Circello, Benevento. Tennessee Fainting Goats are also known as Myotonic, Tennessee Meat, Texas Wooden Leg, Stiff, Nervous, and Scare goats. Teramo are dairy goats are from the hills of the Teramo province, Italy. They are uni-colored: predominantly grey but other colors are possible. Thuringian Goats are a variety ofrndairy German goat found in ThÃ¼ringen, eastern Germany. They were developed fromrnToggenburg, Harzerziege, RhÃ¶nziege, and ThÃ¼ringer Landziege goats around 1885.rnIn the early 1900s Swiss Toggenburg, Harzerziege, and RhÃ¶nziege were introducedrnand Swiss Toggenburg was used again in 1988. 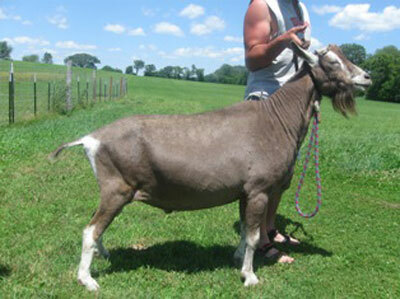 They are chocolate-brown withrnwhite markings on head and legs, a light face mask and white flash on the rump.rnThey may be either polled or horned. Adult males weigh on average 55 kg andrnfemales 48 kg with an average wither height of 78 cm and 74 cm respectively. Theyrnare known for their adaptability to mountainous regions and their ability tornwalk long distances. The breed is nearly extinct. Toggenburg Goats are a Swiss dairy goat from Toggenburg Valley of Switzerland. They are considered to be the oldest known dairy goat breed. They are medium size, sturdy, vigorous, and alert in appearance. Uzbek Goats are from Uzbekistan and are used for the production of mohair. They were developed by the mating of predominantly white first and second generation crossbred females with purebred white Angora males resulted in the appearance of 1-2% of black kids. 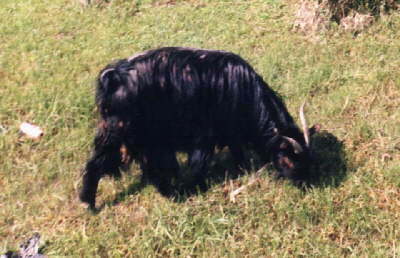 After 4-5 years, there were already several hundred black wool goats; they were gathered into one herd and females were mated only to black males. Such mating produced in the first year 64% and in the second 74% of black kids; others were white, tan, grey, etc. Later, due to positive assortative mating, it was possible to obtain 94% of black kids. 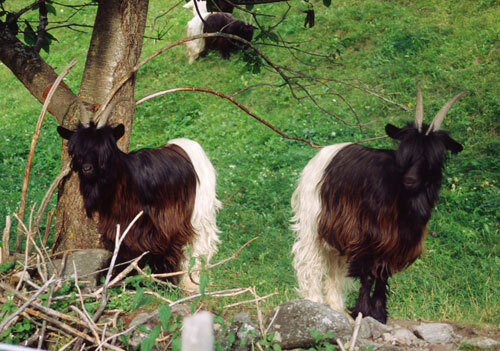 Valais Blackneck Goats are a meat and dairy breed found in Switzerland, Italy, Austria, and Germany. They have a distinctive coloring, black from the nose to behind the shoulder and white from there to the tail. Valdostana Goats are similar to the Alpine Goats in some respects, but they are different in the size, the square-built shape and even more in the powerful horns that are present in the females as well. They may come from hybrids between Goats and Ibex. They are perfectly adapted to the mountain environment. Valle dei Mocheni Goats are from the area of Bersntol (valle dei Mocheni), in the Trento Province, northern Italy. They come in various colors; often have irregular markings and Swiss markings. They are bred for milk and meat production. Valle del Chiese Goats are from the Chiese Valley, Italy. Valle di Fiemme Goats are from the Fiemme Valley, Italy. Vallesana Goats are Italian goats that are also known as Col Noir de Valais, Valaisan a col noir, Walliser Schwarzhals, Schwarzweisse Walliser Sattelziege, Vallesana del collo nero, Vallese, Chevre des Glaciers, and Valais Blackthroat. Vallesana Goats native to the border between South Novarese (Piedmont) and the Swiss canton of Valais, where they are raised. In Italy they grow in mountainous areas of the province of Verbania and Vercelli (Piedmont). At Waipu, the northern part of the North Island, New Zealand, there is a small flock of feral goats, probably the remnants of Angoras farmed in the area since the late nineteenth century. It is believed that there are now very few left in the bush area to which they were originally confined, the main population currently being held by a member of the Rare Breeds Conservation Society. These may be all the Waipu goats now remaining. It is also possible that this small population is among the purest original Angora stock left anywhere in the world, as most of the Angoras of today have been crossbred to some degree to obtain commercial animals with hybrid vigour. West African Dwarf Goats are from coastal West and Central Africa. They are the progenitor of the African Pygmy and Nigerian Dwarf breeds in the United States, and the Dutch Dwarf and Pygmy goat breeds in Great Britain. White Shorthaired goats are dairy goats from the Czech Republic. They are the result of selective breeding of native Czech landrace goats crossed with Swiss Saanen goats in the early 1900s. they were recognized as a breed in 1954-55 and is now found throughout the Czech Republic. White Shorthaired goats are similar to the Saanen in appearance; they are white and shorthaired. Some strains maintain the characteristic Saanen''s black spots on the skin of the nose, eyelids, and udder. They have upright ears and most are hornless (75-80%), with the pollness fixed through systematic selection. 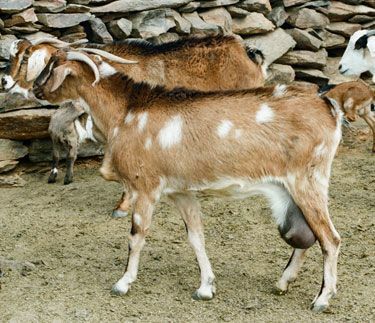 Xinjiang goats are used for milk, cashmere and meat production. They are found in the mountains of Xinjiang in China. They are white, black, or brown. Xuhai goats are a variety of Huanghuai Goat found in Jiangsu, China. They are bred primarily for meat production. Yemen Mountain goats are long haired goats that are usually black and found in the mountains of northern Yemen. Zalawadi Goats are found in the Surendranagar and Rajkot regions of Gujarat,India. They are kept for milk, meat, and fiber production. The Zalawadi is of the Gujarati type and has erect corkscrew shaped horns. 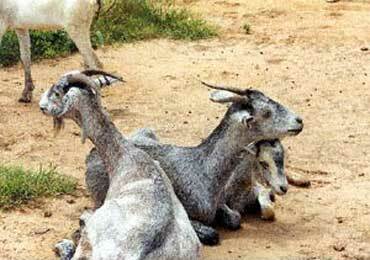 Zalawadi goats compromise 27.8% of the goat population in Surendranagar. The goats are also known by the local name Tara Bakari. Zhiwulin Black Goats are from the northern Shaanxi region of China and are bred for cashmere and meat production. Zhongwei goats are only from the arid desert steppes of the Ningxia Hui Autonomous Region and Gansu Province of China. They are bred primarily for the production of kid pelts, and secondarily for cashmere fiber. They live chiefly, if not solely, on salty or sandy plants or shrubs. 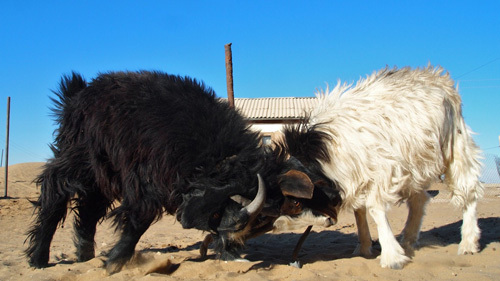 Both genders are horned with the male''s horns stretching upward and twisted. The males average 39 kg (85 pounds) and females 24.5 kg (55 pounds). The Zhongwei reach sexual maturity at five to six months and are generally mated at 18 months of age. The kidding percentage is 104-106 percent.